It took some time being subjected to the ads before this sounded good. I’m not typically a chipotle fan, but it all worked out because the sauce was more honey than chipotle. The first thing I noticed about this $1.59 frankenstein is that it’s on a whole grain / wheat looking bun. This is interesting because whitecastle has never done a different bun style. I find it odd that they would alter their production for just this one sandwich.. but, lo- it was some tasty bread. 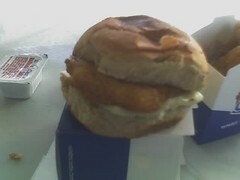 It went with the sandwich much better than the wheat bun on that chic-fil-a grilled chicken I had a while back. The sauce, as I said, wasn’t all that spicy. A little bit of tang to it, but mostly a sweetness. Not bad. The chicken breast was the larger size (which came about after they introduced the “chicken ring” sandwich and the “alaskan” fish sandwich – a poorly publicized move in my opinion). The bottom line? I will get this again. I wouldn’t eat 2 or three of them in a row, but it would make a great addition to a typical bag of burgers. It’s true! I didn’t die of a fast food induced heart attack. plain and simple – these things are a total scam. Don’t waste your money. They are the same thing as the chicken tenders except half the size and twice the cost. 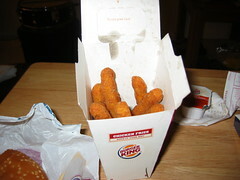 The only redeeming quality of the chicken fries lies not in the product itself, but in the package. As you can see, the box is shaped such that it might find adequate perch in an auto cup holder (although it wouldn’t stand up in mine). Also, the box has a cut out for holding a dipping sauce. good idea, but not worth the inflated price. It’s kind of like when senators tack on some stupid thing to an otherwise good bill, and it makes everyone vote against it..
the box should come with all sides / small items.